Recently, Fearless Toddler has been learning lots about colors. She is so proud of herself for being able to say the names of the different colors + tell us which of her toys are red, which are blue, which are green, etc. So, one day last week while she was taking her afternoon nap, I decided to make a homemade funfetti cake as a surprise for her. I knew that combining her favorite things — cake! sweets! colors! — was sure to be a big success. I looked up a few different recipes, found one that used all ingredients that I already had in the house (woohoo!) + got baking. And the result? This cake turned out fantastic. It was super quick + easy to make, incredibly buttery, soft, + flavorful, + was a huge hit with both Fearless Toddler AND the adults in the house. It *did* turn out denser than a typical boxed funfetti cake mix, but after reading the comments/questions posted on the original recipe, that appeared to be common + expected. I actually loved the texture, and found that it got even softer + more delicious the day after it was made. For the buttercream, I used Recipe Girl’s buttercream recipe that I use all the time. I’ve tried many buttercream recipes, and this is the absolute best – it tastes excellent and always is the perfect consistency. 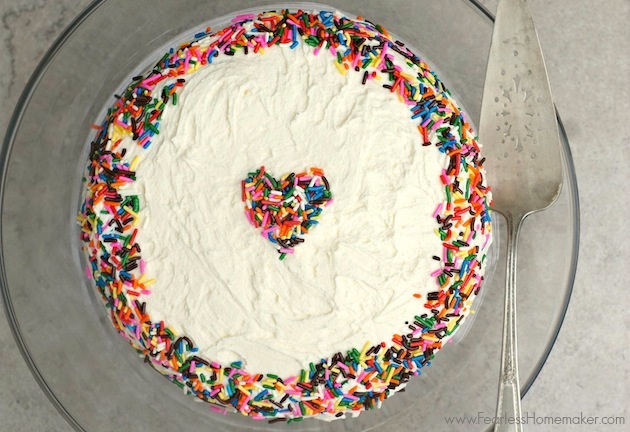 I had extra sprinkles, so I decorated the cake with a rainbow sprinkle border + a simple sprinkle heart in the middle. Fearless Toddler was SO impressed when I surprised her with it after dinner. WOW!, she kept saying. And not surprisingly, she loved it – the cake, the buttercream, and most of all, all the fun colors. So, if you’re looking for a simple, delicious, colorful cake, give this a try! Make the cake: Preheat oven to 350 degrees F. Generously grease and flour a 9-inch round pan. Set aside. In a large microwave-safe bowl, melt the 1 stick of butter in the microwave. Whisk in both white and brown sugars vigorously until no lumps remain – mixture will be gritty. Whisk in the egg, yogurt, milk, and vanilla extract until combined. Slowly mix this wet mixture into the dry flour mixture until no lumps remain. Batter will be thick. Slowly fold in sprinkles, but do not overmix because that will cause the sprinkles to bleed their color into the batter. Pour the batter into the prepared cake pan. This cake takes around 33-36 minutes to bake. What I suggest is to bake it for 20 minutes, then cover loosely with aluminum foil (loosely to avoid the top from sticking to the foil) and continue baking for 13-16 more minutes or until a toothpick inserted in the center comes out clean. Allow to cool for 10 minutes in the pan, and then turn the cake out onto a cooling rack and let it cool completely. Make the buttercream: In a large bowl, with a hand or stand mixer, cream together sugar and butter on low speed. Mix until well blended. Increase speed to medium and beat for another 3 minutes. Add vanilla and cream and continue to beat on medium speed for 1 minute more, adding more cream if needed for desired consistency. Once cake is completely cool, spread the buttercream evenly on cake + decorate with more sprinkles, if desired. Hellooooo there beautiful cake! I’m totally digging the frosting to cake ratio! What a cute and fun cake this is! Cake is my way to learn about colors. What a fun idea! The cake looks gorgeous and I love that thick layer of frosting! That cake is gorgeous! Im a huge frosting fan too so I tend to go big on it too. yes! i’ve made this recipe several times. it is soooo good yours looks fab! Your cake looks delicious!! Love, love, love a funfetti cake! 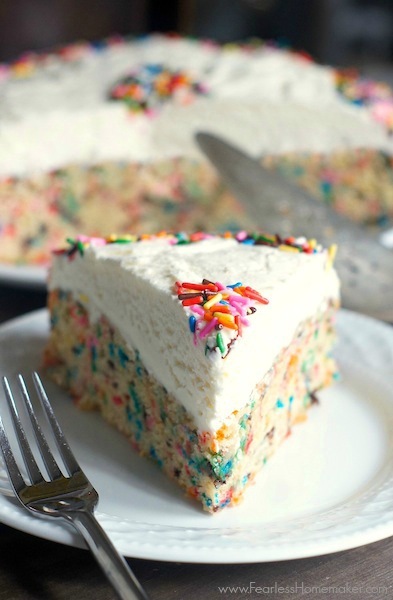 Funfetti is the best cake ever invented! This cake is so gorgeous!! And I love that you made it to celebrate your daughter learning her colors! This cake is gorgeous, Amy! Funfetti is the best, I love all those pretty sprinkles! I can just imagine how much your adorable one loved this cake. So so fun! Such a stunning looking cake! I can see myself eating just this cake for dinner!! Looks so so yumm! This cake does not only look adorable and cute, but I bet it tastes sooooooooooo good!! Perfect cake for a birthday! 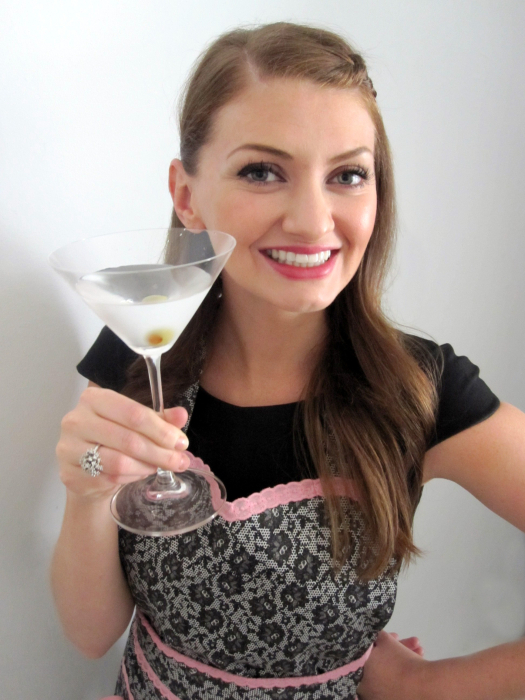 Thanks sweetie for sharing the recipe :). What a beautiful cake. It’s putting as much of a smile on my face as those sprinkles will. 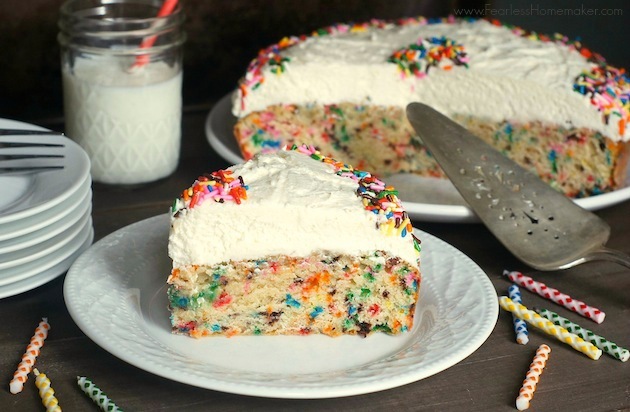 I LOVE funfetti cake and this looks so good! Once when we were newly dating I made my fiance one for breakfast. It was from a box and this looks much better! and from the ingredients it sure is gonna be yummy. Love it!! Such pretty colors – this would be a great birthday cake for a little one. Oh, I love this idea!! I am kinda anti-boxed mix, so I love that you can still make funfetti without a box!! And I love the way you decorated this cake… so cute and easy! Thank you, Jess! My daughter is OBSESSED with hearts, so I know the sprinkle-heart would blow her mind. =) It did! My Daughter’s birthday falls in June. Am surely going to try this. frosting is quick and easy. Great recipe. I’m a huge fan of funfetti cake. Previous post: Kid-Friendly Green Snacks for St. Patrick’s Day!